Over the years start-up leagues have tried to capitalize on the NFL's perceived shortcomings, from the USFL offering spring ball to those whose love for the sport couldn't be contained by one season, to the XFL offering He Hate Me...to the NFL. 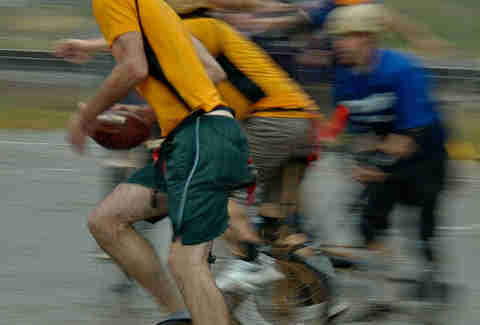 Now rebelling against the NFL's staunch refusal to allow circus bicycles, the Unicycle Football League. 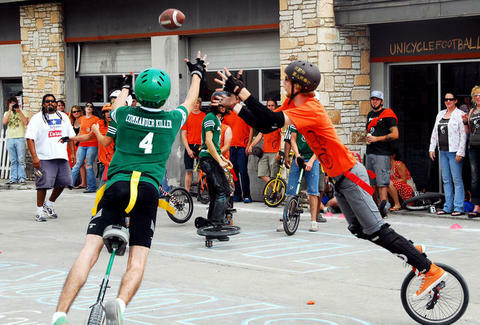 Making its debut on 787 soil this Sunday, the UFL is a San Marcos-based 5-on-5 pigskin league played entirely on unicycles (no, you're not high -- or are you? ), with points scored either by kicking 3-pointers between the upraised outer arms of three hand-holding women (the "Field Goal Foxes") or traversing 50yds of concrete for a "Scored Touchdown" -- not the first time a trip to the endzone has resulted in an STD. 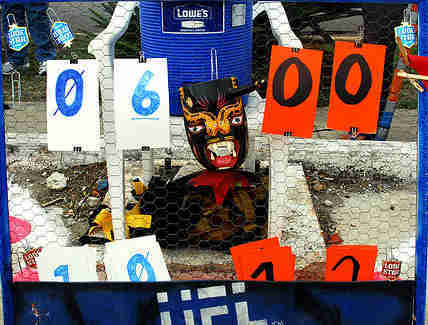 Instead of a coin toss, the action starts with a joust (using a "multi-purpose UFL stick"), followed by four quarters of "flackle" football; each down ends when a flag is pulled or a player uses "the least amount of force required to cause the ball handler to dismount their unicycle", i.e., very little force. The 6-team league is heavy on the Marcos, with squads like the Illeagles, Unicycos, and Gnarwhalz, while the ATX's lone initial representative is Hell On Wheel, comprised of one-wheel warriors F'NA, Special K, Gallo Loco, Herr Trigger, Fo Sho, and RokDaPus, whose garden hopefully does not bring joy to every girl and boy. Furthering spectator value, admission to all games is free, BYOB is encouraged, Baby Zach's BBQ will be catering, and of course there will be a clown-based half-time show. If you want to get involved, just show up to a game or practice session, and they'll set you up with a 'cycle -- provided of course you can ride one, as spicing up the league by allowing first-timers to constantly face-plant would not be very (Rod) Smart.